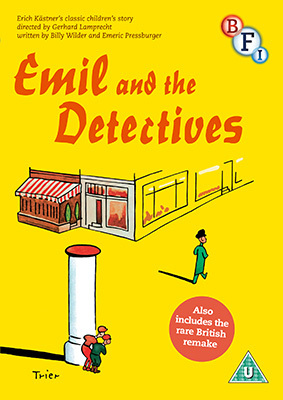 The latest in the BFI's DVD releases of film adaptations of children's books is Emil and the Detectives (Emil und die Detektive), the classic, much-loved story by Erich Kästner. Featuring a screenplay written by Kästner with the legendary Billy Wilder (Sunset Boulevard, The Apartment, Double Indemnity) and an uncredited Emeric Pressburger (A Matter of Life and Death, Red Shoes), this original German version from 1931 is directed by Gerhard Lamprecht. When young Emil is sent to Berlin by his mother, the money he is carrying to give to his granny is stolen by a sinister man on the train. Once in Berlin, Emil follows the thief and enlists the help of a gang of youngsters – ‘the detectives' – to help retrieve the stolen money. One of the first German sound films, Emil and the Detectives provides a fascinating glimpse of Berlin before Nazism and the Second World War. It is accompanied by the 1935 British remake by Milton Rosmer which was set on the streets of London. Once considered to be a lost film, this rare British adaptation has been newly transferred from the only surviving film elements. Emil and the Detectives will be released on UK DVD on 15 July 2013 by the BFI at the RRP of £19.99. Emil and the Detectives (Milton Rosmer 1935, 60 mins): once considered to be a lost film, this rare British adaptation has been newly transferred from the only surviving film elements. Illustrated booklet with original promotional material, contemporary reviews, and new essays by Children's Laureate Michael Rosen, Bryony Dixon and Caren Willig.